A single interoperable system for managing, preserving and sharing institutional digital research data. UK research funders and good open scholarship practice requires universities to make sure their digital research outputs are managed, preserved and accessible. 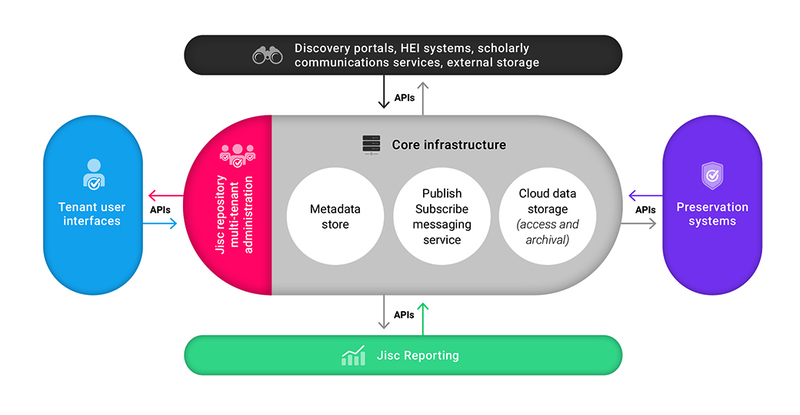 In response to this we developed open research hub, a fully-managed and interoperable research data platform that specifically meets the needs of UK higher education institutions (HEIs). The modular, multi-tenant, multi-content system is made up of the components below. There are a range of service options available depending on your needs. An intuitive interface where researchers and support staff can deposit their research data and other research outputs such as articles and theses. Metadata is harvested by aggregators allowing the data to be discovered and used by others with appropriate access permissions. Based on our open canonical data model, the publish-subscribe messaging service facilitates interoperability with other systems. We have developed adaptors for a number of popular research management systems, preservation systems and open access repositories. We have also published the message API specification which will allow other vendors and suppliers to develop their own adaptors to enable their systems to link into the service. Data is stored in European cloud-based storage combined with local storage to provide the optimal mix between speed and cost. Keeps deposited data usable for as long as is required or mandated. Institutions will have a choice of preservation providers. Provides transparency for the researcher, HEI and funder. It uses a combination of metadata stored in the core infrastructure alongside information from other integrated systems and services, such grant IDs. Information can also be exported into the institution’s business intelligence systems. Our standard cover runs from 09:00 to 17:00 (GMT/BST), from Monday to Friday (inclusive), but excluding public holidays for England and specific Jisc closure days (Jisc closure days are typically any non-public holiday days and between 25 December-1 January). Our monitoring service runs 24/7 and major issues are dealt with accordingly by our out-of-hours incident team. Our service level agreement (SLA) timers run only during your agreed hours of cover. Our monitoring runs 24/7, 365 days of the year regardless of your cover. We aim to be flexible and recognise that sometimes there are special circumstances. Perhaps the issue affects your customers, or key staff are having issues with a critical project with an impending deadline. Our technicians can override our standard priority assessment where there is good reason, if you have made us aware of it. To report an incident, you can contact us in multiple ways. Email help@jisc.ac.uk with the subject line "JORH"
We will give two months' notice of any scheduled maintenance. Any outage during this time is not included in the calculation of the availability. From time to time we will need to carry out emergency maintenance not covered in the scheduled maintenance. In the event of emergency maintenance being needed we will inform you with as much notice as we can. We use industry standards and best practices for your information security. As an organisation we conform to ISO/IEC 27001 code of practice. The Jisc repository was ISO 27001 audited in November 2018. This includes: assessing security risks, taking account of the threats, vulnerabilities, impacts, implementing information security controls and review of these information security controls so they continue to meet security needs. A quarterly review meeting will be held with a representative from Jisc to review the service, any issues and to see how we can provide a better service to you.